Since you pay for the data you use on Project Fi, you want to take as many steps as possible to prevent unnecessary data usage when not on a WiFi network. Here are three steps you can take on your phone to help minimize the data hit while using cellular data. 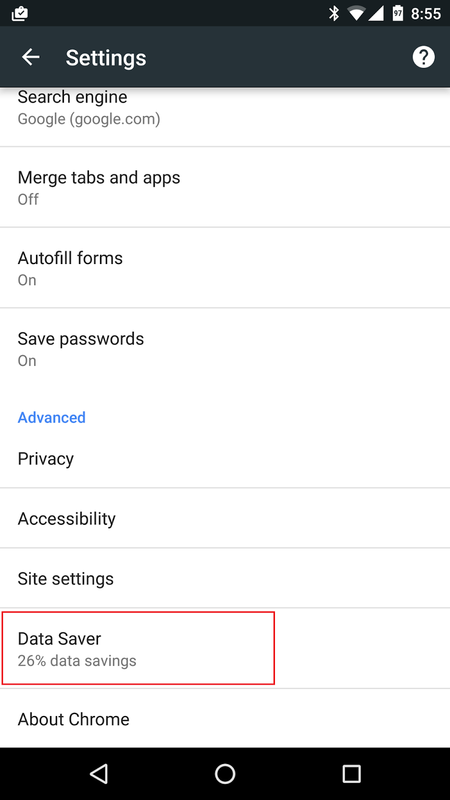 Touch the Chrome menu, then Settings. Under "Advanced," touch Data Saver. You no doubt have a lot of apps on your device, and these apps regularly get updated by the developers (hopefully). 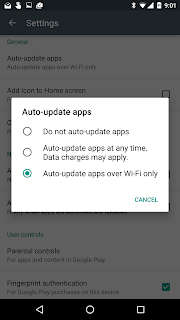 But you definitely do not want to update these apps when you are not on a WiFi network or you will certainly take a huge hit on your data usage. Make sure you go into the Play Store app on your device and open up settings. 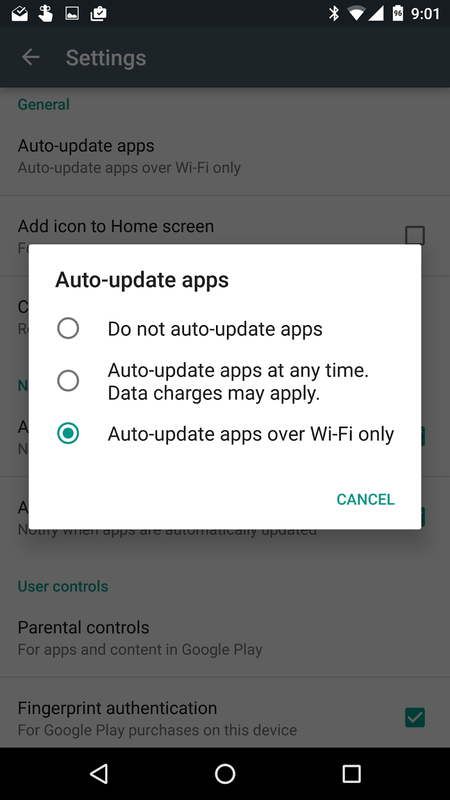 Once in settings, under General>Auto update apps, make sure you set your device to Auto-update apps over Wi-Fi only. This will ensure no apps are updated when on cellular data only. Many of you, like myself, enjoy listening to music with your device. 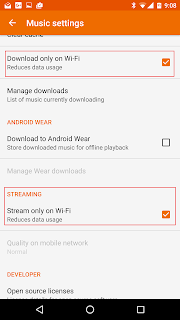 There are a few ways to make sure you don't get hit with data usage while using Google Play music. 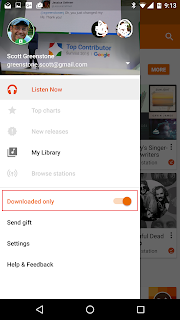 First, the obvious choice, download the albums or radio stations that you listen to onto your device. I have discovered that you can download a bunch of radio stations from All Access and then shuffle them to play all of them mixed up with each other, thus preventing yourself from getting bored while listening to the same station. 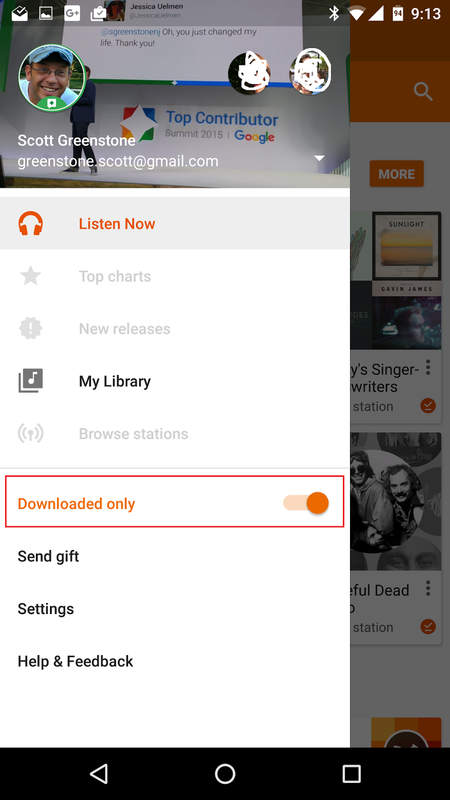 Radio stations will automatically download additional songs as you go through the play list. So what I have done to ensure I don't get hit with excessive data usages from music is turn on Download on Wi-Fi under the settings. I have also turned on Stream only on Wi-Fi to make sure I don't stream music when I unknowingly leave a WiFi network and return to cellular only data. A final step I have is that I have enabled the Downloaded only option under the three bar menu. I only turn that off when I am on a known WiFi network in order to download new radio stations or new songs/albums to my device. This is another stop gap to make sure I don't accidentally use up my data due to music. I am sure there are other tips to save on cellular data usage, but these are the big ones that I employ. 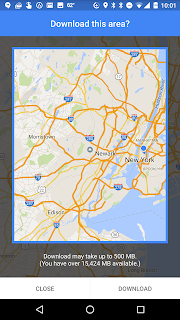 Google Maps provides an option to download certain areas of a map that are around a searched or saved location. 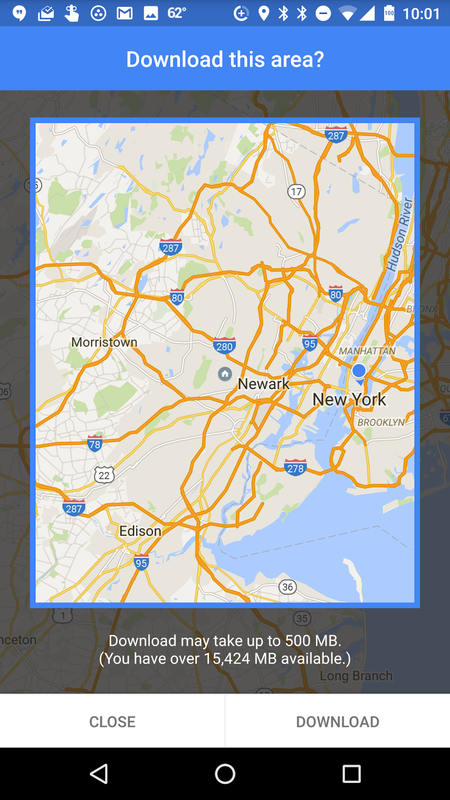 Once you have that area downloaded, the directions will be using that map and will utilize very little data, if any. The data usage will most likely be for traffic updates. 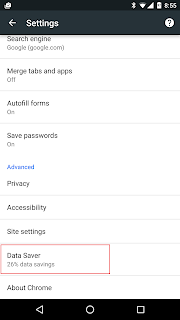 Google Plus also offers an option in settings to conserve data usage. However turning this on may effect image quality, but to be honest I have not noticed anything negative with the image quality. Many people are using the Android N developer preview, myself included. 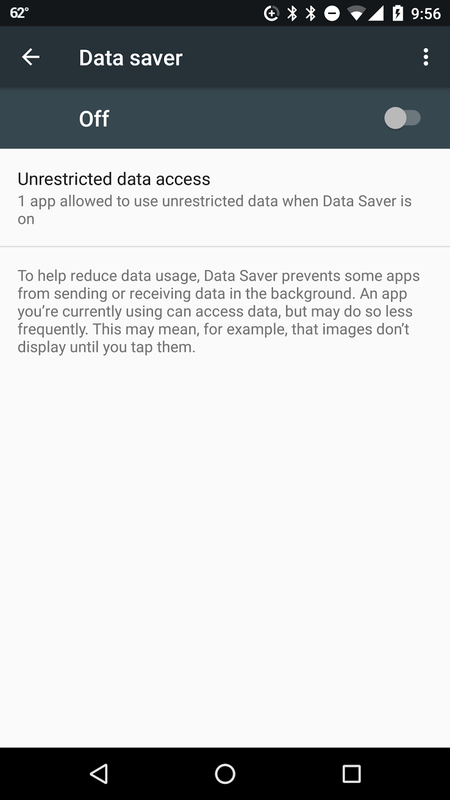 Very excited to report that there is a Data Saver feature that will automatically restrict apps from using background data. 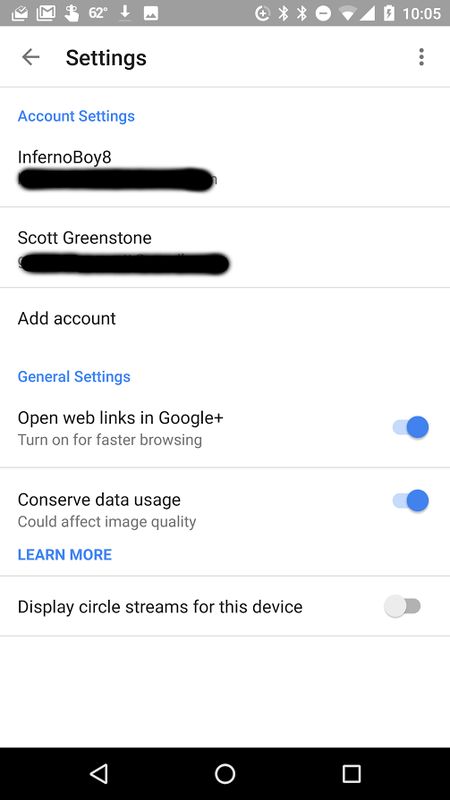 You can set certain apps to have unrestricted access to background data, but this is definitely going to prove to be a nice feature for Project Fi users. Well done! Deployed all ur suggestions. Thx! Works like a,dream! I don't seem to be able to get into the Chrome menu. All it gives me is help and feedback. Are you clicking on the three dots on the top right? Because Google can't make up their minds on simple design issues you have to use the dots on the right about half the time and the pancakes on the left the other half. Maybe this is why Eric Schmidt uses an iPhone. 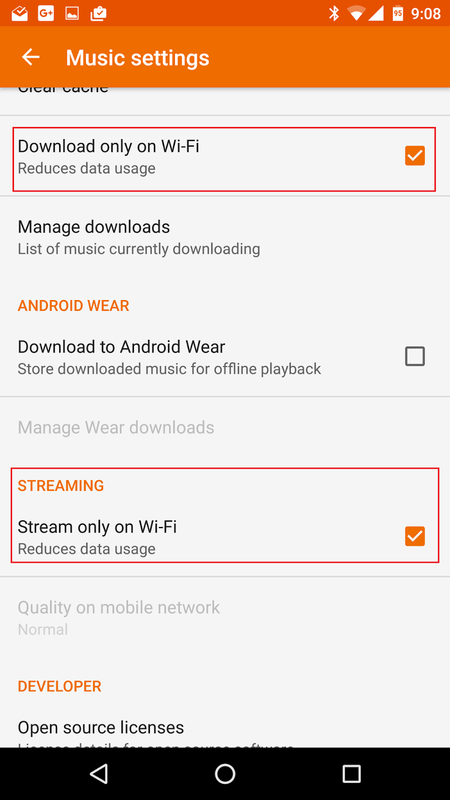 If you want to keep music streaming, you can set the quality to the lowest setting. 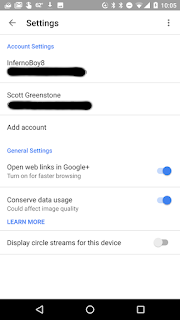 In Google Photos you can also set that to only backup your images and video when connected to WiFi. I have it set for only when in wifi and plugged in. That way it's not burning battery when I may need it. My data usage went from about 4gbs to 1.5gbs by simply using Waze versus Google Maps for navigation. Using Google Maps' "Offline Areas" feature to pre-download your maps over wifi will likely save you even more cellular data usage than using Waze. They can be set to auto-update every 30 days, only over wifi. The size of maps you can download appears to be greatly improved over previous incarnations of this feature. The only real concern is storage space, but this appears to be better than it used to be before as well. All of San Diego is 396 MB. 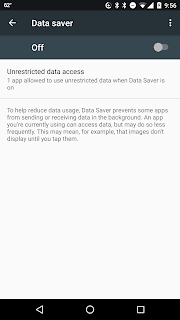 Any information about restricting background data in individual app settings, do these data saving measures effect how the app performs??? Hey Jay, I have no idea if there is any negative effect there. I actually have not gone to the individual app level myself yet. Jay, I recently did this for several apps including ones like Amazon Photos, Plex, and other similar apps. I was pretty frustrated because, even though I have those apps set to only upload over WiFi and not to update themselves on cellular, I noticed that Amazon Photos alone used over 135mb of cell data! Now, that's not the biggest problem in the world but it's $1.35 that I shouldn't have had to spend (and made the difference in my going over my data amount for the first time this month). After restricting the apps, I've not noticed any weirdness in how they act and my data usage is lower. I did get the warning from the Android system that they may act strange but I tried it anyway and have had zero trouble this far. Hope that helps! Did some research and found It won't synchronize with anything unless the app is open. Depending on the app, that may or may not mean a change in data usage. In Maps, it only offers me the choices of Home and Work to save for offline. How do I get other areas saved offline? Can't seem to create a New area on that dialog. I've been thinking of checking out Android N. I heard that it's extremely stable and in final beta stage.How do I download is it in the google store? Most importantly do you think I'm ready??? Jay, on my N6 I had no problems with Release 1,2 or 3. On My 6P release 1 and 2 I had lots of problems with, but release 3 has been excellent so far.